This recipe and post are contributed to Nourished Kitchen by Megan and Rose of Fig and Fauna. If you are interested in contributing to Nourished Kitchen, please read these guidelines. While every carrot, beet and potato still rest deep beneath the soil, perfectly ombre painted radishes emerge from the surface of the ground. They are a welcoming kickoff to a hopeful season of produce to come. Radishes are not alone in this early rising, as they are among many clusters of bright green tomatoes. 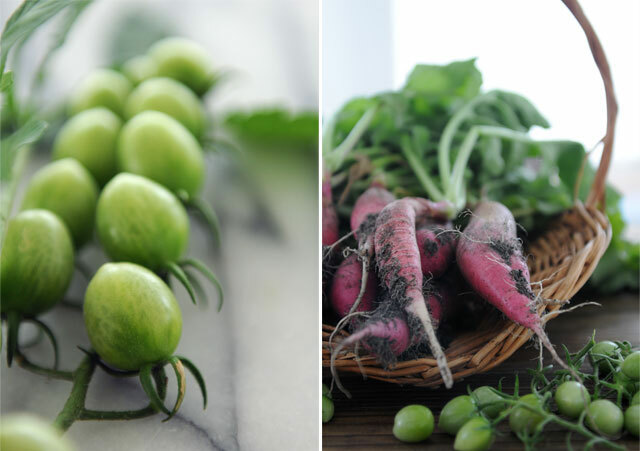 My impatience to wait for them to ripen pays off, while immature tomatoes offer a tart acidity that mingles so well with the heat of a crisp radish. It’s not a coincidence that our cilantro is blooming lacy bouquets of flowers, tempting me with the idea of a springtime salsa. My family enjoys this colorful salsa particularly on white fish dishes, like Fish Tacos or grilled Mahi. If green tomatoes cannot be found, tomatillos or yellow heirloom tomatoes are a good alternative. Wow–this sounds delicious! So fresh. This is scrumptious! I like my tuna salad topped with this salsa. One of my favorite herb is marjoram and I can’t wait to try this salsa with marjoram. I love the simplicity. Fig and Fauna take ordinary meals and turn them into art both visually and gastronomically. I have read that green tomatoes should not be eaten raw, should always be cooked before eating. Has anybody else heard that before? I’ve never heard that. What’s your source? Like many other nightshades, tomato leaves and stems contain atropine and other tropane alkaloids that are toxic if ingested. Ripened fruit does not contain these compounds. Leaves, stems, and green unripe fruit of the tomato plant contain small amounts of the poisonous alkaloid tomatine. Use of tomato leaves in tea (tisane) has been responsible for at least one death. However, levels of tomatine are generally too small to be dangerous. I think I feel happier in eating ripe fruit in general. Dr Natasha of GAPS recommends only ripe fruit as easier to digest I think. I’m sure this recipe could be done with red tomatoes too? A teeny amount of tomatine is not going to hurt you, particularly if you’re not sensitive to nightshades. Clearly Megan and Rose relished their green tomato salsa and are no worse for the wear. We need to stop being afraid of our foods – all plant foods contain antinutrients and small amounts of potentially toxic substances, and that doesn’t mean they’re poisonous or dangerous. That said, if you find that this recipe doesn’t work for you as it’s written, like all recipes, it can be tweaked. Perfect! My husband will thank you for this, he loves radishes!! I believe that Megan and Rose are in Florida, lucky girls. It snowed in CO yesterday! So can you eat the white flower clusters on the cilantro??? You can eat flowering herbs, yes! We love them. Flowering thyme is lovely. I’m interested in the green tomatoes too. We’re months away in our part of California, though we can definitely find tomatoes at the market that have been brought in. What kind of set up does the author have to produce the radishes and green tomatoes in the spring? We haven’t had a lot of luck with green house tomatoes and when the weather warms, the radishes obviously fizzle. I’m making this today! I have all the ingredients, perfect! No. I don’t believe there’s any evidence to support that. There’s many, many instances of people eating radishes raw – fermented in kimchi or as pickles, on their own, in salads, in sandwiches. There’s bigger issues on the plate than the innocuous radish: excess sugars, refined oils – now those’ll actually hurt people, but only in the long term. The radish? It’s pretty darn innocent. I’m sure, though, that if you eat mountains of it raw, it will also likely cause problems. Sounds lovely however will have to wait a while here in the UK. Radishes are indeed an early crop for us but tomatoes aren’t as we have to wait for the frosts to be over and mostly grow them undercover particularly for early crops. Given there were warning of snow a week ago we will not have tomatoes, even green ones, for a bit yet. I shall keep the recipe till then however so it sounds fabulous and I’m always on the look out for other ways to eat radish which i love. Well, we love the salsa, and we aren’t dead..yet…lol. I love apples, too, and eat the seeds…with cyanide…still breathing! Thanks Jenny! And Megan and Rose! 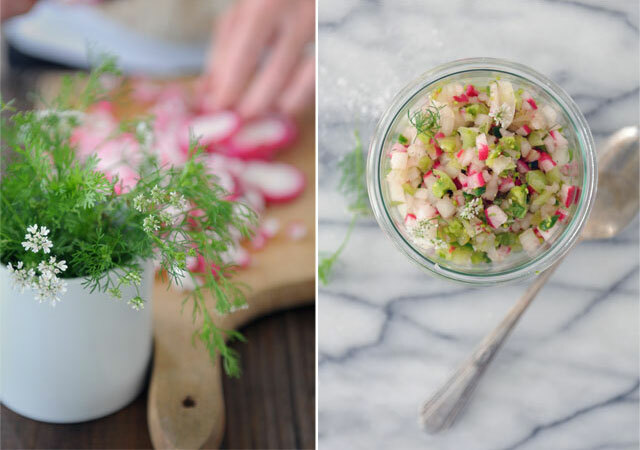 Thanks for the great idea to add radishes to salsa. So many people assume that salsa has to be red and tomato based but this is just another example of the different ways we can prepare salsa. You’re right – it would taste delicious on fish tacos. Can’t wait to try it! my goodness, your photography is SO beautiful. Thank you for your promotion of WAPF, sound PCOS advice, and of course, the absolutely breathtaking photos. Love this recipe- a little different and totally delicious, not to mention beautiful ( so colorful)…thank you. My plan was to have it with fish tacos on sprouted corn tortillas– I ended up adding some (about 1/2 the volume) thinly sliced napa cabbage (sort of a salsa-slaw hybrid)… YUM! So glad that I found this recipe! If I wanted to make a fermented version of this, would I have to do anything more complicated than adding salt and whey and leaving it out (like any other fermented condiment)?